The Basics - Software Projects Inc.
You created a rock solid specification document and posted it on ODesk.com, Elance.com, Freelancer.com or any of the other freelancer sites. Within a matter of hours, you have dozens of bids from software engineers around the world. All of them carefully reviewed your specification document and made sure it's a perfect fit for their skills before submitting their bid, right? Winning projects as a freelancer, is a numbers game. The more projects you bid on, the more likely you are to win a few. Based on this logic, you should try to bid on as many projects as possible. Unfortunately a lot of freelancers abuse the system, creating scripts for automatically submitting canned bids, to all new projects in their category. Take a closer look at the bids you received. Do they mention anything specific about -your- project? Or could the same bid very well apply to any other project in this category? In most cases, you don't want to work with a freelancer who didn't even take the time to read your specification document and submitted a canned bid, without ever stopping to think if this is a good fit with their skill-set. When you bid on this project, start your bid with "loglr.com is great", so that I know you actually took the time to read this spec. This helps me in eliminating canned bids. If the freelancers bid doesn't include this text, I immediately know it's a canned bid. After you get rid of the canned bids, you're left with freelancers who took the time to carefully review the specification document. 1. Do you have experience creating similar apps/websites? 2. Can you share with me links to your previous work? 3. Do you have experience working with the programming language and platform I described in the document? 5. What milestones do you suggest? 6. How much time do you expect it will take to complete this project? 7. How will we communicate during this time? If the freelancer answers to all of the above questions are satisfactory, shortlist them. Pay close attention to their communication skills, how long it takes between each reply, how detailed are they and how well you understand them. Narrow down the best matches, to a list of two or three freelancers. You are going to award the project to all of them at the same time. The freelancer who creates the best result, will be the one you'll continue to the following projects with. Yes - I am suggesting you actually award and pay two or three freelancers. Think of it as "cost of doing business". It's an essential price to pay, for finding the perfect fit for your needs. If you were building a new home, would you jot down your ideas for the house in a short Word document, then send them over to construction workers and expect everything to work out well? And yet, when it comes to software development, most people do exactly this. They expect a simple unabridged outline of their thoughts, should be all an accomplished software engineer would need to get the job done. Software engineers need a detailed specification document to work by. In the real world, when you build a house, you would start with an architect. Your architect's job is to translate your vision into a diagram, with detailed measurements and notes about which materials to use. A builder then takes the diagram prepared by the architect, orders the required materials, creates a work plan, rounds up the construction workers to do the work and manages them on a day-to-day basis, until the work is completed to your satisfaction. In the software development world, these two roles are played by a Product Manager and a Project Manager. The Product Manager's role is to translate your vision, into a language software engineers can understand, using very detailed descriptions, screenshots and visuals, not leaving any room for interpretation. This document is called a Specification Document. Getting it right is the first step in ensuring your project will be a success. The Project Manager's role is to manage the software engineers until they successfully build a working program that works looks and feels exactly as described in the specification document. Ideally, it would be best if you have a professional help you with preparing the specification document. Try to reach out to a Product Manager, who has experience in preparing such documents. If you don't have access to a Product Manager, your next best option is to reach out to an experienced software engineer and ask for his/her help. Explain what this project is about. Who are the users, what function does it fill and what is the value proposition. Detailed list of goals. Be as specific as possible about what you want to accomplish with this project. Include screenshots and examples of similar websites/services as necessary. Step-by-step description of all the screens a typical end user will go through. Include screenshots, or mockups - very important! Explain the architecture of the product, which modules you want to have created and how they should interact with each other. Provide a link to your preferred coding convention, so that it's easier to later manage the code. Your estimated budget and target timeframe for the project. Ask the software engineers to confirm they can meet these, or work with you on reaching a mutually agreed-upon budget and timeframe, before the project starts. Include contact information for your project manager (probably you) and be clear about expecting daily updates from the engineer, outlining the progress of the work. Make yourself available via Skype, email, or phone. Be sure you are responsive and insist on getting frequent progress reports, along with links to review the project at every milestone. Similar to an architectural diagram, a good specification document leaves no room for interpretation. Two different qualified software development teams, should be able to create the same result, if the specification document is sufficiently detailed. 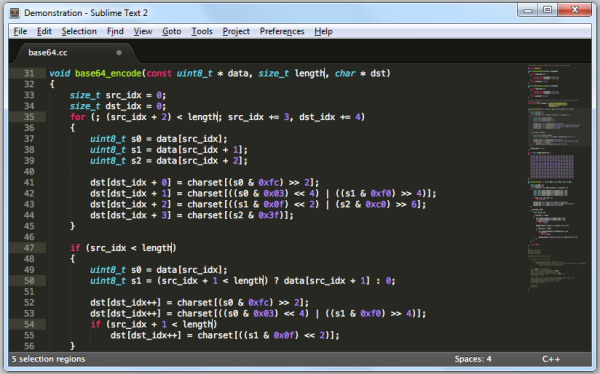 Sublime Text is a fast, sophisticated text editor for code. Up until recently, PHPStorm and Notepad++ were our two favorites. PHPStorm has a very extensive feature-set: syntax highlighting, autocomplete, refactoring, html wysiwyg mode, a built-in debugger and file indexing. But it's heavy. Slow. Bloated. Notepad++ is fast, but it's missing a lot of the goodies found in PHPStorm. Windows, Mac OS and Linux binaries are available. Package Control is now installed. Close Sublime text editor and restart it for changes to take effect. Open Sublime text editor, click Ctrl-Shift-P and type "Install Package"
Search and install these packages, one by one. Simply type the package name and click it to install. Sublime PHP linter relies on PHP being installed on your machine. You'll want to get the Thread-safe ZIP version. Extract the ZIP file to a new "C:\Program files\php" folder. Open Sublime editor Preferences menu, select the SublimeLinter Settings under "Preferences" - "Package Settings", locate the "sublimelinter_executable_map" block and enter the full path where PHP is installed. Free introductory webinar that covers the basics of Microsoft AdCenter and how you can drive traffic to your site from msn.com and yahoo.com. * An overview of advertising on Bing and Yahoo! Search with the Microsoft Advertising adCenter platform. * Tips for setting up search, content, and mobile advertising campaigns. * Bidding and budgeting best practices. * Guidance on selecting keywords that will give your ads a better chance of reaching your target audience. If you love technology, entrepreneurship and the world of online business, there are a few great web shows I'd like to recommend. Software Projects, a New York based full-service Internet Marketing firm, is seeking a bright, articulate, detail-oriented, and technical applicant interested in joining our group of software professionals. As a Technical Account Manager, you will work directly with clients, translating client vision into technical requirements, submit weekly plans, manage teams of engineers and oversee all software development work. You will brain-storm with engineers, think outside the box, provide direction and leadership, while directly interacting with some of the best minds in our industry. You will be working from your home office for the first six months. After that time, you will have the option of relocating to one of our offices or continuing to work from home. Send an email to hr@softwareprojects.com with your resume and let us know when is a good time to chat. Didn't update your resume in the last 2 years? That's fine. It's all about your experience and skills! Send us a quick cover-letter and we'll follow-up. While these are still Must have pages, nowadays, every decent website is expected to feature a blog / forum, photos, videos, social network links and do a better job of "telling the company's story", showing the people behind the site. I was looking for a simple "push-button" solution to create a skeleton of such a site, but couldn't find one. SPI does offer thousands of pre-made website templates, as well as custom website development, but I wanted a simple fully-functional template to help new clients get a quick-start with their websites. You can use my template to get this setup live, in 30 minutes or less. Signup for Facebook, Youtube, Twitter, Digg, LinkedIn, TwitThis and FeedBurner. The template includes easy to modify top.php, bottom.php and sidebar.php files, that control the header, menu system, footer and sidebar links. These three files are included on all pages. Note: You can get the latest version of WordPress here. To keep this process streamlined, I've included WordPress as part of the zip file. (a) Rename includes/config.php.new to includes/config.php and update 'dbname', 'servername', 'username', 'password' with your database details. 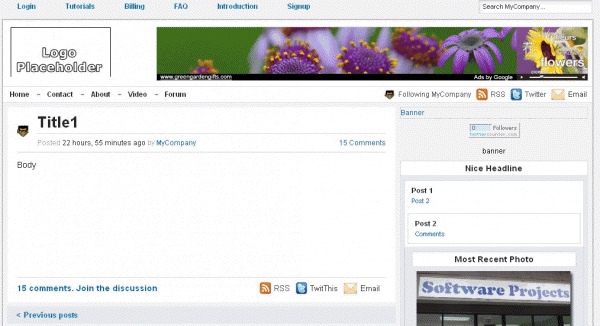 Update config.php with your company name, tagline, keywords and social network usernames. In the future, I will update this template to include a built-in image gallery, the SPI FAQ service, the SPI Helpdesk service, Customer back-office and a video links manager.